Facebook’s highly anticipated F8 developer conference is underway, with founder and CEO Mark Zuckerberg taking the stage to announce the latest updates to come from the social network’s universe. Not only is Zuckerberg sharing new features from the Facebook platform, but he’s also giving us glimpses into what we can expect from companies that now exist under the Facebook umbrella, like Instagram and WhatsApp. On Tuesday, May 1, Zuckerberg announced that WhatsApp would soon be bringing group video calling to the popular communication app, making it possible for folks to have face-to-face conversations with multiple people at once. 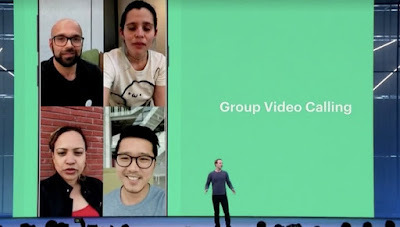 Previously, video calling was only available between two parties, but moving forward, we should be able to bring in groups of at least four. In addition to group video calling, WhatsApp will also be offering support for stickers in the months ahead, Facebook revealed later in a blog post. That means that third-party developers will soon be able to offer playful ways to communicate within the popular messaging app, something that Facebook’s own messaging app, Messenger, has offered for years.